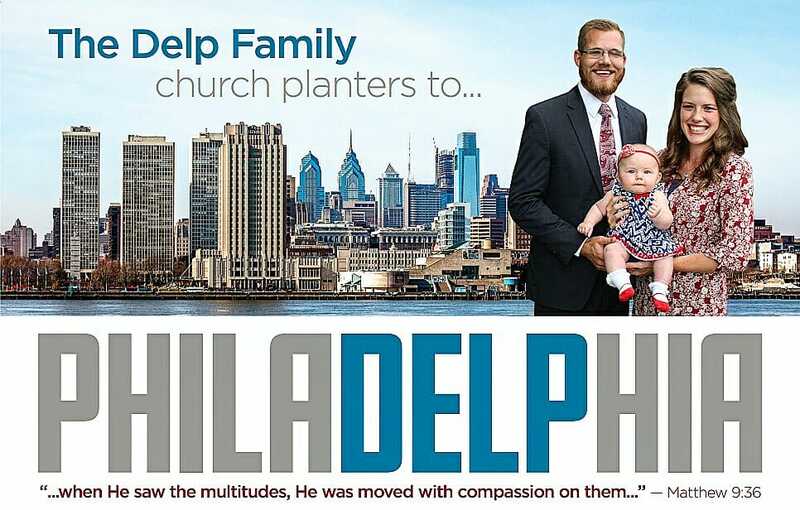 Joe & Katie Delp have planted Open Door Baptist Church in Northeast Philadelphia, PA. Their first service was October 14, 2018 with an attendance of 88 people and one saved! Happy New Year and greetings in the mighty name of our Saviour, Jesus Christ! Let me begin by apologizing for the delay on these newsletters. Thank you for your faithful prayer and financial support of Open Door Baptist Church in Philadelphia. I know I haven’t met the wonderful church family yet, but it is our prayer and desire to meet you all as soon as possible. Your Pastor has been an incredible help and encouragement to us both personally and in the early stages of this brand new church plant. We love Pastor Hamilton so much! At this time I'll list month by month a number of things the Lord has allowed us to be a part of in His work. Of course, with October 14th being the Grand Opening of ODBC, this was obviously a very monumental day. It was a day we will forever cherish in our hearts. We were beyond encouraged by the 88 people in attendance. We are so grateful for family members, friends, as well as families and individuals from our Mayfair neighborhood in Philly who came out for this special day! My friend Brother Bob Larsen said, "In Church Planting you have the Grand Opening and then you have reality. The real work begins." Since the Grand Opening we are overwhelmed by God's grace. We praise His name for all He has done, is doing and will continue to do for His glory. The Wednesday after our 1st Sunday service, we began our regular Wednesday evening Prayer Meeting and Bible Study in our home, which is less than 2 minutes from the church building. Each Wednesday we have a joyous time of fellowship over refreshments, testimonies, Bible study and prayer together as a brand new church family. These Wednesday evening meetings have been so precious to us. From the first Saturday following the Grand Opening, we began regular Saturday morning Door-to-Door Outreach for our church. On Wednesday, October 31st we had our first big Church Outreach. With the world celebrating "Halloween", we thought it was a great opportunity to give the gospel and invite people to church. Halloween is highly celebrated in our neighborhood of Philly. We put together 500 Gift Bags with Church Invitations attached to them. We set up two tables on the church property and prayed for a good outcome. Well, in less than 2 hours (starting at 5:00pm) all 500 were gone! There were many fantastic conversations that took place. We concluded that evening with our Prayer Meeting. The biggest praise from that Church Outreach opportunity was that we had a family of 6 who met us that night come visit us the following week and they have been faithfully with us Sundays and Wednesdays ever since! Our second big Church Outreach was on Election Day (Nov. 6th). Would you believe that the church building God provided for us to meet in is our local voting poll? Praise God for another great opportunity to give the gospel and invite people to church. Shane Ferris (who serves with us at ODBC) helped me set up a table with all of our church info on display. We purchased Dunkin' Donuts coffee and bottles of water to give out for free to all who came by our table. Praise the Lord for people who have been coming to ODBC as a result of meeting on that Election Day! Nov. 11th was our 1st annual Veteran's Day Sunday. I had personally been able to invite a number of veterans to attend the service, but unfortunately none of them did. I took the opportunity to express to our young church family the honor and respect we'll always show to our heroic veterans. ODBC's 1st annual Neighborhood Thanksgiving Dinner was hosted on Tuesday evening, November 20th. We rejoice in the tremendous turnout we had from the community. Katie's parents and three of her siblings were able to be a part of this great event by singing a couple special number's and serving all the amazing food that was prepared. We've had folks consistently coming to ODBC as a result of this event. I'm thankful for an amazing wife and other ladies, who labored so much in the food preparation for this wonderful time. I preached a Bible message on Thanksgiving. With all the teens God provided for us to minister to, we wanted to have an exciting Youth Christmas Party for them. This took place on Friday, Dec. 14th. We had a spectacular time of fellowship over food, games and challenge from the Bible! Many young people came to our home for this event. There's an incredible potential with these teens for Christ! We were were excited to have our 1st annual Christmas Eve Candlelight Service! I appreciate the servant's heart of my wife, brother, the Kuenzi family, McMenamin family and the White family, who all did an absolutely spectacular and beautiful job with all the music! I preached from II Corinthians 9:15 on "The Unspeakable Gift". Praise God for no issues with all of the lit candles! We look forward to a beautiful Candlelight Service each year, by God's grace. For New Year's Eve we had a total of 19 people gathered in our Philly rowhome for some wonderful fellowship over food, games testimonies, prayer and Bible challenge! Shane Ferris put together a great video recapping all the Lord has done since October 14th (That video is attached to this email.). It is shocking to realize we're already in 2019. The first Sunday of 2019 (Jan. 6th) was our Vision Sunday where we presented our theme for the new year. The 2019 Theme for Open Door Baptist Church is "ROOTED IN CHRIST" taken from Colossians 2:6-7 where the Bible says, "As ye have therefore received Christ Jesus the Lord, so walk ye in Him: Rooted and built up in Him, and stablished in the faith, as ye have been taught, abounding therein with thanksgiving." As a brand new church plant rooted in Christ, may we continue in Christ in 2019, being rooted and built up in Him! We have seen the Lord save souls already here in Philadelphia! May many more come to Christ in 2019. Our average attendance on Sunday mornings is over 55 people. To God be all the glory. Jesus must increase, but I must decrease. Please pray for Katie and BabyBoy who is due March 10th! They are doing great. Praise the Lord. Please pray with us and believe God for a Great Awakening in Philadelphia. May God save this city! Please pray for the city of Philadelphia and specifically for the neighborhood of Mayfair (over 97,000 people in this one neighborhood) God has called us to. There are 57 neighborhoods in the city of Philadelphia (over 1.5 million people). Our church plant is the 10th independent Baptist church in the city, which means there are still 47 neighborhoods without a solid, Bible-believing, Bible-preaching church. Please pray that the Lord will provide a couple or family to serve with the youth of the church. Please pray that our hearts will stay on fire for the goal: The glory of God and the souls of Philadelphia. We praise God for how He specifically led us to the Northeast Philadelphia neighborhood called Mayfair. We praise God for His provision of a vehicle for our family for our deputation travels. We praise God for His provision of a building to use right in the neighborhood of Philly where He’s called us. We praise God for a Deacon from New Testament Baptist Church (NC) who built our pulpit and Lord's Table. We praise God for the home He provided for us to rent less than 2 minutes from the church building in Mayfair, Philly. We praise God for a number of churches and individuals who came to Philly to go Door-to-Door with us leading up to the Grand Opening. Thank you for being one our supporting churches and thank you with all of our heart for your faithful prayers! Great is our Lord! Please take a few minutes and watch the video that has been attached. We would love for you to show the "New Year's" video to your church family if able.